Wembley means different things to different people — ‘football’, ‘concerts’ and ‘Indian food’, depending on who you ask. Located in the borough of Brent in northwest London, the area is best-known for Wembley Stadium and Wembley Arena. It’s also renowned for Fountain Studios, home to the X Factor and many other TV shows. Lenny Henry, Russell Grant, designer Wayne Hemingway, the late Claire Rayner and rock star Keith Moon of The Who have all lived here at some point in their lives. According to recent UK census data, more than two-thirds of Wembley’s population is Asian — of which nearly half is Indian — so it’s no surprise that it has a large number of Indian restaurants and food shops. 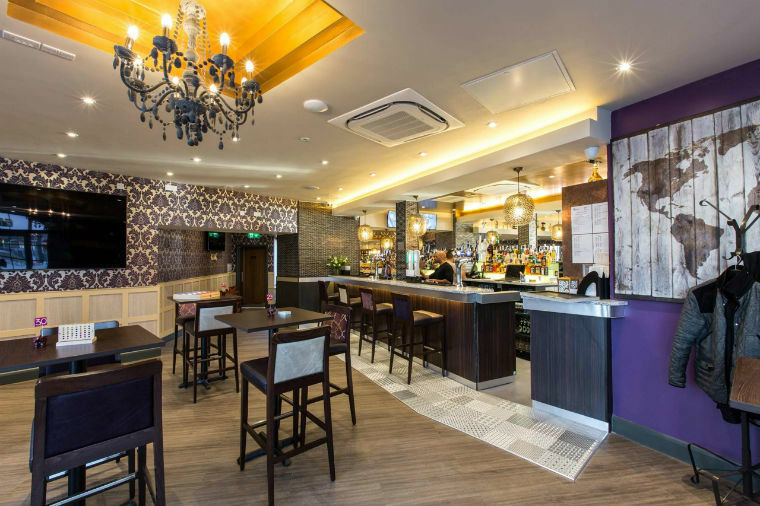 Mostly located around Ealing Road and the High Road, many are modest, family-run Gujarati and south Indian vegetarian places, but there are several north Indian and Sri Lankan restaurants, too. On event days at the stadium and arena some venues might insist upon special set menus, or may have different opening hours, so do check before making a special journey. 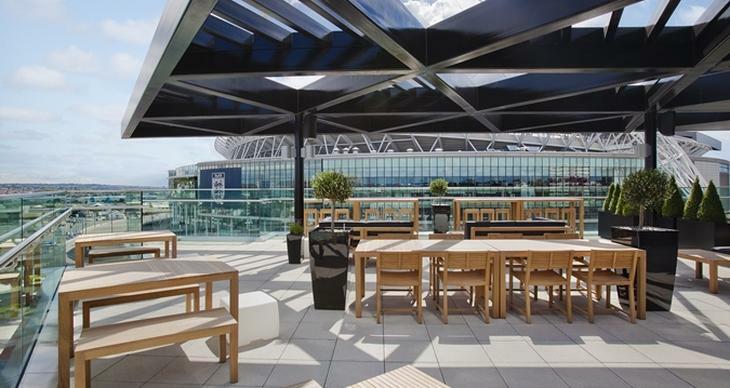 The terrace of Sky Bar 9 at Hilton London Wembley. Make a sweet start to your day with a late breakfast or brunch of US-style five dollar pancakes, waffles or French toast at Sugar Mill Desserts — a pudding-centric restaurant in Lakeside Way. These come with tempting toppings like chantilly cream and roasted banana. Even more tempting are the weekend unlimited breakfast buffets, featuring savoury Full English items plus as many pancakes and waffles as you can manage. If you fancy something spicier, head to Sarashwathy Bavans on the High Road, or Saravanaa Bhavan, round the corner on Ealing Road. South Indian rice-and-lentil dishes like dosa, idli and uthappam are traditionally eaten for breakfast, and these no-frills cafés have large menus featuring many such classics. Don’t forget to try Mysore coffee, a latte-like drink poured speedily and repeatedly from one container to another from a great height to produce foam and density. Sarashwathy Bavans and Saravanaa Bhavan are equally good for lunchtime options — but get there early before they’re crammed with local families with kids. Named after different Hindu gods (the words ‘bhavan’ and ‘bavans’ mean ‘house’, i.e. ‘house of god’), the two restaurants are not connected, but are part of separate international chains. Further along Ealing Road, down at the Alperton end, there’s long-established Sakonis, which combines vegetarian Indian fast food, street food and teatime fare. It started as a Gujarati snack and juice stall at a local greengrocer, before evolving into a large café. It’s recently been refurbished and relaunched with a new menu. Even further down, Mumbai Local, an offshoot of the neighbouring grocery shop, is a relatively new arrival. The small venue specialises in Bombay-style street food and snacks, and has queues snaking out the doors. It’s almost impossible to get a table at weekends. Across the road is Maru’s Bhajia House, a tiny unassuming café that’s renowned for its ‘crispy bhajia’. These deliciously spicy Kenyan-Gujarati potato fritters are massively famous within the worldwide Indian community. The much-imitated recipe remains a closely guarded secret. Away from the hustle and bustle of Ealing Road, East Pan Asian Restaurant is perched atop the nearby Loon Fung Chinese supermarket. It’s a contemporary canteen that serves Cantonese-fusion dishes, dim sum and sushi in calm and relaxed surroundings. The food is particularly suited for sharing. If you’re looking for something lighter, head to Peppercorn in Empire Way. The friendly café sells a good selection of sandwiches, soups, salads, pies, pasties, jacket potatoes and cakes. Sandwiches and pastries also feature in the beautifully designed Ecco’la Café in Wembley Park Drive, but it’s the fabulous pizzas and pastas that people come for. Also worth noting is Wembley Park Food Market near the tube station on Wednesdays between 10am-3pm. Here you’ll find a regularly changing selection of street food dishes from around the world; plus meat, seafood and cakes. Wembley Park is undergoing a huge regeneration at the moment and while the Wednesday food market reigns supreme, from August 2018 there are due to be five different street food vendors popping up between 11am-3pm. There's due to be a new (and massive) Boxpark arriving later in 2018, too. It's all go-go-go. No foodie visit to Wembley is complete without shopping in one of the many Indian and Sri Lankan grocers, greengrocers and kitchenware shops on Ealing Road. We’ve already told you about the best ones here. Stock up on spices, catering-sized packs of basmati rice and wheat flour ‘atta’, and speciality fruit and veg seldom seen elsewhere. You’ll also find curiosities like four-tier contraptions to make south Indian idlis, and antique Indian cookbooks selling for mere pennies. Additionally, there are plenty of alphonso mango stalls (when in season), vendors selling kulfi and sugar-cane juice, hole-in-the-wall street food joints and much more. It’s colourful, noisy, crowded, friendly — and very much like being in India, circa 1980s. Of the many ‘mithai’ shops selling Indian confectionery, we can recommend Suraj Sweet Mart and its neighbour Ashapura; plus Prashad further down Ealing Road. Very popular with Gujarati students and bachelors who miss the taste of ‘mum’s cooking’, Suraj also sells delicious savoury snacks and curries to takeaway. The bar at the Black Horse. 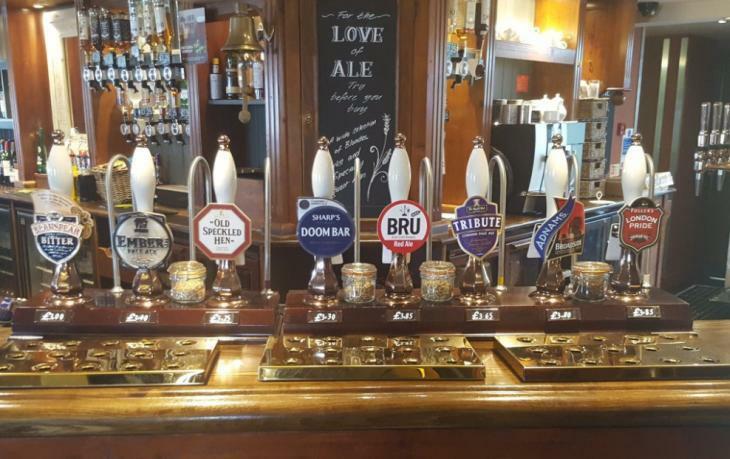 If all this shopping has made you thirsty, chill with a glass of cask-conditioned ale at The Preston in Preston Road, or its sibling The Black Horse in Harrow Road. Both Ember Inns pubs boast roaring fireplaces, have large drinks lists, and a wide selection of classic pub grub. Another family-friendly pub with a great range of food and drink, The Green Man is handily located near the stadium and arena. It has a spacious beer garden with panoramic views and a children’s play area. If you’re looking for something glitzier, how about Sky Bar 9 at the top of Hilton London Wembley? Sit down with a glass of Pimm's, champagne or cocktail on its terrace, and admire the views overlooking the stadium. The Arch contemporary Indian restaurant. The Hilton is also home to The Association Restaurant, an upscale venue that serves modern British dishes. Smoked salmon salad, belly of pork, fish and chips, steaks and pastas are all on its menu; along with grills, pies and classic puddings. Opposite the stadium, La Regina is a smart Italian that serves pizzas, pastas, risottos and many other well-executed dishes within Saint George’s Hotel. And located under the stadium’s Arch, Wembley Tandoori may have an uninspiring name, but is one of very the few places in the capital to serve Nepalese and Tibetan food. Avoid the ‘curry house’ clichés, and opt for the likes of Himalayan chaw-chaw (noodles) and momo dumplings. Also in the area, Harrow Road is home to two very good venues. Long-established, family-owned and family-friendly Arena serves imaginative Greek dishes. The Arch is unlike any other Indian in the area. Housed in a converted pub, the smart restaurant and hotel serves a well-conceived north Indian menu — with a number of exciting Gujarati items you won’t find elsewhere. A little-known gem near Wembley Park tube station is the Tower Restaurant, the training arm of the College Of North West London’s catering and hospitality department. 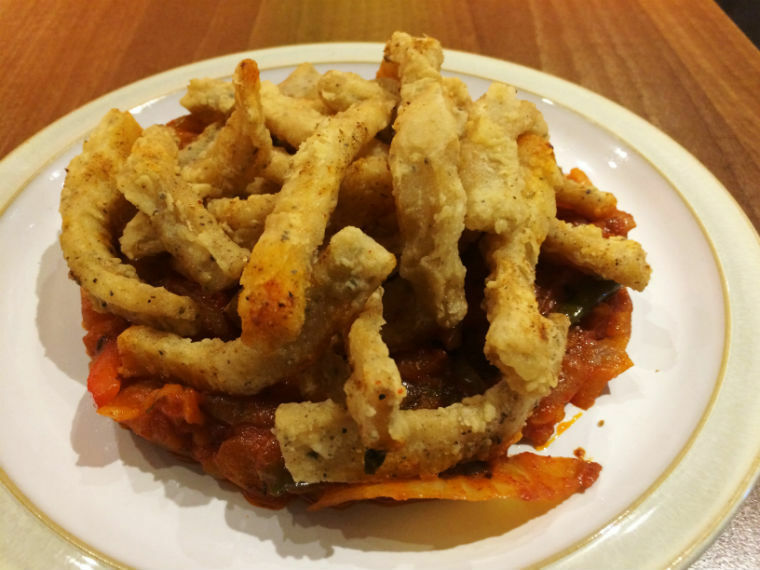 It serves a simple, budget-friendly menu of modern British dishes cooked by students during term times. Over in north Wembley, Karahi King is hugely popular with Indian families and post-cricket boys’ night outs. The simple café-like venue has been serving punchy, assertively spiced Punjabi fare for many years. Back on Ealing Road, Fat Papaya has a different look, feel and menu from its neighbours — a bright, contemporary space that serves lesser-known pan-Indian dishes and cocktails. Here you’ll find banana leaf-wrapped king fish, chicken drumstick curry, Sri Lankan goat biryani, and cardamom-infused panna cotta. We like its short, snappy menu — everything is freshly cooked from scratch using local and sustainable ingredients. Nearby Palm Beach is popular with the Sri Lankan community, who insist that the food is some of the most ‘authentic’ in London. This is the place to come to for a large selection of kothu roti and string hoppers. Gujarati restaurants used to be the norm here (before south Indian and Sri Lankan ones started opening some years ago), and Asher’s Africana is one of few to have retained its core ‘Gujju’ identity. (‘Gujju’ is a term of endearment for Gujaratis.) The unassuming café with welcoming staff serves tasty, traditional dishes increasingly rare outside the kitchens of Gujarati mums and grandmas. They’re cooked from scratch throughout the day — no ‘curry house’ catering-pack sauces from a central kitchen here. Late night cahoots at Masti. There’s a lot of late-night ‘Masti’ (good-natured mischievousness) in Wembley, exemplified by a restaurant, bar and club of the same name. 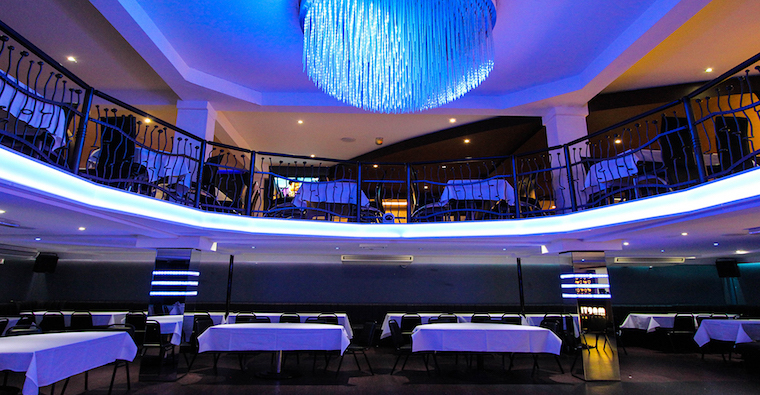 It serves up a vibrant combination of traditional Indian food, spicy cocktails, energetic dancing and Bollywood DJs on the High Road. The Liquor Station down the road is another popular after-hours pit stop, a lively bar with plenty of food, drink, music and DJs.